The foundation of modern accounting began during the Renaissance period when Italian mathematician Luca Pacioli published a book detailing the benefits of a double-entry system for recording accounting transactions that provided greater transparency to shareholders. Technological innovations over the years have augmented the process, but even as high-speed computers and cloud-based networks have automated recordkeeping and largely replaced mainframe data storage, double-entry bookkeeping remains a closed system lacking visibility between companies. Blockchain technology, however, could change that. By simultaneously adding a third entry and then posting it to a shared ledger visible to all permissioned participants, blockchain is poised to enhance accounting processes and data storage. In a time when businesses are facing new challenges to improve data management and security, blockchain is emerging as a way to let companies make and verify transactions instantaneously without a central authority. A growing number of companies in diverse industries worldwide are leveraging blockchains to improve their accounting, banking, and business processes. Originally created to support bitcoin and other cryptocurrencies, blockchain is a decentralized, shared ledger of financial transactions. Each block is composed of separate transaction batches forming a continuous, sequential chain in a data structure, thereby enabling multiple users to share information in a public (permissionless) or private (permissioned) computer network. At its core, anything of value can be transacted, moved, and stored securely in a blockchain distributed ledger without requiring a central point of control (see Figure 1). 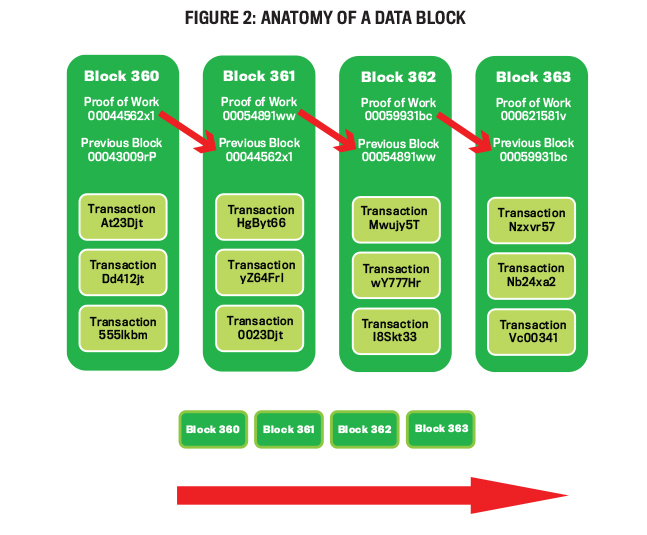 Transactions, contracts, assets, and other business data accumulate and post to individual blocks, and once the blocks are “full,” they are added to the chain in sequential order (see Figure 2). One of blockchain’s unique features is the addition of a third entry for each transaction. In the traditional double-entry accounting system, each company maintains a separate set of books. Costly, time-consuming audit processes then compare the transactions for accuracy and completeness. In contrast, a blockchain enters transactions directly into a shared ledger in chronological order and then creates a third entry visible to all network participants (nodes). Figure 3 shows an example of how blockchain creates the third entry. As two parties create transactions, the system uses a consensus process to validate each new transaction, create a third entry, and then post it to the shared ledger. This enhancement to the double-entry method provides a cryptographically sealed receipt containing a unique digital signature for each entry, thereby making fraudulent alterations almost impossible. The improved transparency, combined with continuous updates posted in the distributed ledger, supplies both managers and auditors with real-time information (see “CASE STUDY: Double-Entry vs. Triple-Entry Accounting: How Blockchain Works” at the end of this article). Traditional audit processes have remained virtually unchanged for decades. While some auditing processes have improved, inefficiencies and redundancies remain. The inspection, confirmation, sampling, and other analytical methods can be cumbersome, manually intensive tasks. Combined with external verifications and multiple reporting requirements, they often result in wasted time and duplications of effort. Sampling—an essential part of document inspection and review—is based on the premise that the characteristics of an entire population are the same as those selected in a representative sample. While sampling allows the auditor to make conclusions without testing all transactions and frees up time to focus on exceptions and high-risk areas, there are inherent weaknesses in this process. Bias, the risk of incorrect acceptance or rejection, sample inadequacy, and insufficient sample size can fail to find material discrepancies or fraud. In contrast, a blockchain process offers a better alternative: Instead of reviewing samples, auditors can test 100% of all transactions across multiple companies in minutes and generate an exception report identifying any inconsistencies found. Other time-consuming processes, such as sending out confirmation notices and verifying statement balances, are unnecessary because the invoices are checked for accuracy when posted to the distributed ledger. As more businesses migrate to digital records, the need to detect forgeries and alterations also has increased. Blockchain protects the integrity and improves the transparency of documents by having them stored and cryptographically sealed in the shared ledger visible to all members. Any attempt to alter a record sends an immediate alert to all members in the chain. Will blockchain technology eliminate auditing? Not likely. Rather, the technology will drive changes in the audit approach, including procedures employed for a blockchain ecosystem. For example, traditional point-in-time forensic tools aren’t applicable in a system that updates information in real-time mode, and while companies using blockchains have enhanced transparency and utilized cryptographically sealed entries, the same challenges still exist to evaluate the risk of inaccurate or fraudulent information and to apply professional judgment to complex transactions. As companies continue to pressure audit firms to reduce fees and increase value to clients, technology can help eliminate redundant tasks and improve efficiencies. By lowering costs, auditors can devote more time to internal controls, complex mergers or acquisitions, and analytics. Using blockchain will allow auditors to focus more time on client needs and eventually perform real-time or “smart” audits of financial transactions. Banks have been slower to embrace the digital revolution than other business sectors. Yet the changing business landscape is presenting opportunities for banks to create a new ecosystem that reduces costs and tailors applications for isolated or unbanked populations. Current cross-border payment transactions are complex and costly, involving multiple banks, intermediaries, and clearinghouses. The average completion time can range between three and five business days, with costs ranging from 2% to 10%, depending on the payment amount. Globalization and e-commerce have strained these processes further because of the increase in high-volume, low-dollar payments. 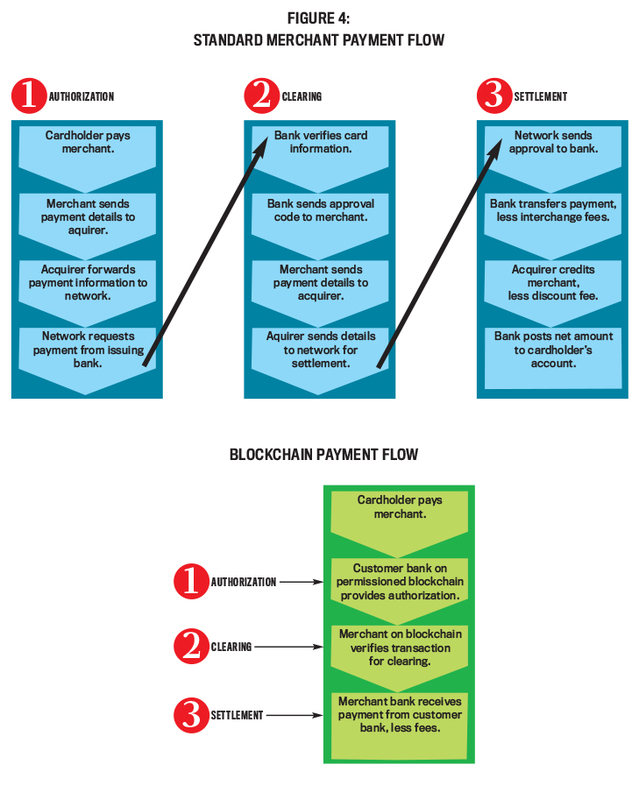 Figure 4 shows the efficiency gains using blockchain to process a credit card payment. Blockchain’s asset-transfer capabilities coupled with its elimination of intermediaries reduce both the time and cost of processing transactions. For example, blockchain removes three steps from the authorization process alone, thereby reducing the use of intermediaries or other third parties to reduce the processing cost of payment transfers. This process can complete cross-border payments in minutes instead of days and at sharply lower fees—all while providing increased transparency by enabling all parties to validate payment dates and details. Today, almost two billion adults worldwide are either unbanked (i.e., have no access to banking services) or isolated from traditional business services. In Africa, there’s no shortage of businesses, but political discord, costly SWIFT (Society for Worldwide Interbank Financial Telecommunication) bank codes, and isolated payment systems prevent microfinance banks from making international payments. Last year, RedCloud Technologies used blockchain technology to enable Nigerian financial institutions to reach customers in remote areas and provide affordable customer payment services. Similar initiatives in the sub-Saharan region, India, Cambodia, and Bangladesh are providing mobile or alternative banking services in areas where bank branches are limited to urban areas. Companies in diverse industries such as music, healthcare, and retail are employing blockchain technology to improve transparency, intellectual property protections, and processes. Artists in the music industry want more control over their compensation as well as the distribution rights and copyright protections for their works. For most of the industry today, touring and label companies divide revenue generated and often dictate distribution terms to artists. Other intermediaries in the music supply chain collect performance royalties and send the remaining proceeds to producers and managers. Artists are usually paid last, with the amounts dependent on their contractual arrangements and with little supporting documentation. Blockchain offers a different music ecosystem that centers on artists controlling distribution channels, reducing intermediaries, and receiving fair compensation for their work. Companies like Mycelia, Ujo, and Voise use blockchain technology to add smart contracts that require payment before users can download a song, enabling artists to track revenues across numerous distribution channels. Blockchain also allows artists to bypass traditional intermediaries, sell songs directly to the public, and receive higher compensation than with streaming services like Spotify. These enhancements have improved accessibility for consumers, increased transparency for artists, and improved intellectual property protection for the music industry as a whole. In the medical profession, decades of regulations and inefficiencies have created barriers to innovation for the storage and retrieval of patient data from separate databases, and new privacy rules have led to longer delays in updating or correcting patient records. As a result, a vast majority of doctors and hospitals are unable to share medical data safely, and patient information is updated manually from different databases. As the need for sharing patient information increases, the medical profession views blockchain technology as a solution for healthcare providers to safely exchange medical and other information. One example is MedRec, a blockchain-based permissioned network visible only to authorized participants that allows doctors to see patient file updates in a single ledger. The distributed ledger can manage a host of functions, including authentication, confidentiality, and data sharing among different systems. The blockchain architecture also provides an innovative approach to ensure data integrity while providing patients with a safe, transparent way to view their medical records (http://bit.ly/2rAes69). And in the retail industry, blockchain technology can help address the protection of credit card information. Consumer frustration with credit card information theft is increasing, and high-profile hacking occurrences at Target, Home Depot, and eBay underscore the need for greater security and less reliance on a single server. Last year, the Nilson Report estimated global credit card theft losses at more than $24 billion (http://bit.ly/2UIK1b3). In response to the problem, MasterCard developed Safety Net, a blockchain-based system to monitor transactions worldwide. Utilizing algorithms combined with a global monitoring system provides a multilevel approach to detect fraud, intercept cyberattacks, and block suspicious transactions. Despite the enthusiasm surrounding blockchain, obstacles remain for widespread adoption. Employee training, system integration, and regulatory considerations are some of the key concerns that must be addressed. Few technologies have the potential to disrupt the employee training landscape like blockchain does. Traditional training in accounting procedures and checkpoints is becoming obsolete as more accounting procedures migrate toward automation. Software programs like smart contracts—embedded code in agreements that generate instructions for payments, asset transfers, and inventory shipments—highlight the need for a well-designed, collaborative effort to help leverage talent at all levels of the organization. Management needs to understand the impact of blockchain technology and help retrain employees as business processes continue leveraging new technological advances. Integrating new software with legacy systems requires an analysis of potential bottlenecks, conflicts with existing platforms, and data security. For example, the time needed to integrate blockchain with existing systems is a significant concern, particularly if testing interrupts or shuts them down. Securing intellectual property and other sensitive materials could require additional changes and incur additional costs. Similar issues can occur if current systems aren’t interoperable with blockchain software and need replacing. Finally, even though blockchain technology has superior encryption capabilities, it doesn’t guarantee absolute protection against cyberattacks. The need to safeguard data from hackers in a blockchain requires the same level of diligence as with other system designs. Regulatory compliance has always lagged behind technological advances, and blockchain is no exception. Current accounting framework guidelines lack formal audit procedures for blockchains, and few harmonizing rules exist despite the creation of several multinational task forces. Some countries are divided over whether the public nature of blockchain will hinder efforts to provide security, especially for the transborder movement of private financial information. Also, since blockchain ledgers exist on nodes in multiple locations, they could be subject to different state or international jurisdictions, thereby colliding with current legal definitions and tax laws. As with any new or disruptive technology, blockchain technology will create new opportunities and may change or eliminate other jobs. Learning new technical skills, improving data security, and integrating this technology into multiple industries are just a few of the future opportunities available for accountants and finance professionals. Accountants will need to understand how algorithms and digital signatures are created and validated since that’s central to recordkeeping requirements in the distributed ledger. Reviewing contracts will gain importance to ensure they aren’t linked to side (or “off chain”) agreements. Also, the methods for identifying possible collusion by one or more members to perpetrate fraudulent transactions may be different because of the system’s architecture. Improving access to regulators and providing real-time information for managers will require accountants to develop new processes and protocols for different reporting requirements. Domestic and foreign regulatory reporting rules require transparency and daily reporting of trade and other financial transactions. The ease of tracking asset movements on a digital ledger will facilitate the collection and sharing of information with regulators in multiple countries. Integrating blockchain technology with IT systems will require a new approach to provide data and cybersecurity solutions. Devastating virus attacks combined with ransomware are examples of how data breaches cause business interruptions on a global scale. The latest WannaCry virus affected systems in more than 150 countries and sent multiple ransom demands to unlock business data files. These attacks highlight the increasing vulnerability of centralized systems and the need to improve them. Opportunities aren’t limited to the private sector. As more public sectors convert traditional governmental accounting records to a blockchain environment, management accountants will have a pivotal role to review and facilitate the transition. For example, Delaware now stores and shares government records using blockchain technology. In 2018, Vermont became the first state to sanction a real estate transfer utilizing a blockchain registry. Other states are adopting blockchain legislation, and Congress formed a caucus dedicated to studying blockchains. The governments of the United Kingdom, Singapore, Estonia, and Georgia are utilizing blockchain platforms for healthcare records, personal identification, voting, and pension claims. And in 2017, Dubai announced an initiative to move all government agencies to a blockchain-based platform by 2020. Until blockchain technology increases in scale, it’s difficult to gauge the full impact to accounting jobs. As self-validation of accounting transactions increases, however, more clerical and back-office duties will either be cut or reshaped. We’ll see more opportunities to expand audit skills, regulatory knowledge, and IT expertise to support this new environment. As accounting processes continue to leverage new technology of all types, the 20th Century task-oriented accountant may become as outdated as a pegboard ledger card. Blockchain is more than a passing business fad du jour—it’s now a reality in banking, business, and governmental sectors. As investment grows in blockchain applications and start-ups, the business landscape is set to change dramatically within five years. MarketWatch experts believe the technology disruption will extend to several financial sectors including mutual fund asset managers, pension fund companies, Wall Street brokerage firms, and escrow agents. In addition to private sector investment, universities around the globe have begun to offer courses and certifications in blockchain technology. Accounting firms are also providing blockchain and other emerging technology training courses that focus on updating the skills needed for future changes in the marketplace. According to some estimates, blockchain-related jobs increased by 200% alone in 2017, and job postings requiring blockchain expertise are expanding across several sectors. 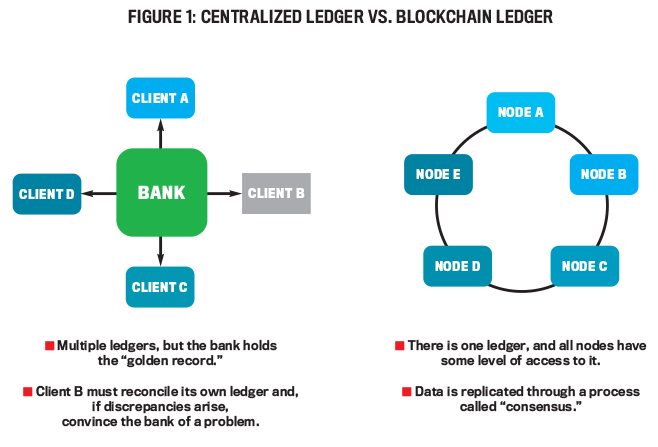 As blockchain technology gains momentum to reshape diverse sectors, the distributed ledger will change how we store transactions, reconcile accounts, bill customers, and pay invoices. Adding triple entries will enhance transparency and trust with investors and stakeholders, and automation features can streamline everything from inventory tracking to regulatory reporting requirements. According to Tom Mornini, CEO of Subledger Inc., “Accountants are currently involved in a lot of transaction processing, reconciliation and control activities that are fraught with error possibilities, both unintended and intended. This scenario could change significantly if blockchain technology gets adopted on a widespread basis in this space. It’s a major game-changer for sure” (http://bit.ly/2Ef8SO2). As accountants face future challenges—and changes—to the profession, understanding the role of new technologies and systems is a critical success factor to provide meaningful contributions to the entire financial reporting chain. Five centuries ago, the double-entry system revolutionized accounting processes and improved transparency in business operations. With the exponential pace new technology adaptations are moving businesses toward a digitized world, accountants can improve how we communicate and interpret business transactions with tomorrow’s systems. While challenges remain to maximize blockchain’s potential, this technology is poised to transform how we conduct financial activities on a global scale. Is it time to enhance a centuries-old accounting process with new technology? I think Luca Pacioli would say yes. TJB Manufacturing decides to purchase inventory from HEQ Widgets over a three-year period, with annual increases in the per-unit pricing. HEQ sends TJB a sales agreement, and TJB signs and returns a copy to HEQ. The flowcharts in Figure A show how the transaction is processed between the companies. Multiple steps, time delays, manual reviews, and possible data entry errors reflect the disconnected and cumbersome steps required in a double-entry system. There are numerous points of failure throughout the process, including lost paperwork, inaccurate documents, and disputed payment amounts. 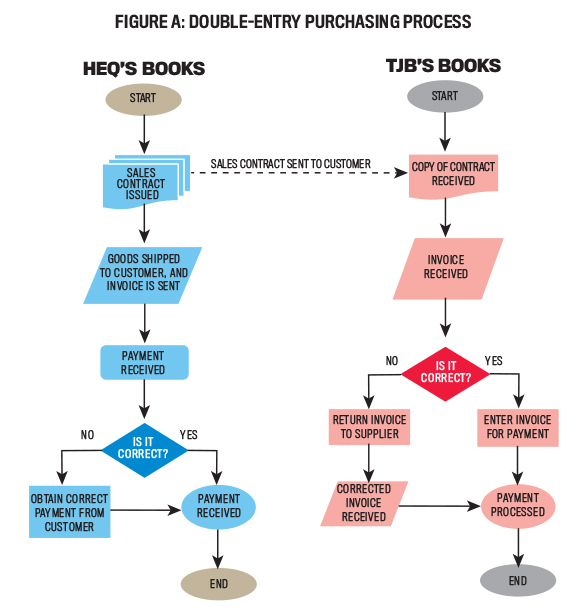 In Figure B, the same transaction using a triple-entry approach reduces processing time and the need for intermediaries. In this example, five companies, including HEQ and TJB, created a permissioned network. HEQ and TJB approve a smart contract with embedded code for the three-year period and add it to the distributed ledger. The blockchain’s immutable digital fingerprint combined with the ability to self-execute the contract terms and conditions avoids time delays, errors, and the need for intermediaries to send confirmations, schedule payments, or mail account statements. Since the blockchain maintains the smart contract, managers and auditors can see the agreement, and it eliminates the need for requesting duplicate copies. The figure shows the reduction in steps to perform the same transaction. The system creates a hash string serving as a Proof of Work (PoW) in each block, providing visibility to all members. After the network participants validate the entries, the system adds the approved transactions and links the hash string from the previous block into the current block. Both companies then receive a secured copy of the transaction, and the completed block is cryptographically sealed and linked to a continuous blockchain in chronological order. This system also reduces time-consuming accounting reconciliations and processes at both HEQ and TJB, including sending out confirmation notices and verifying statement balances, because invoices, checks, and other transactions are checked for accuracy before they post to the blockchain. 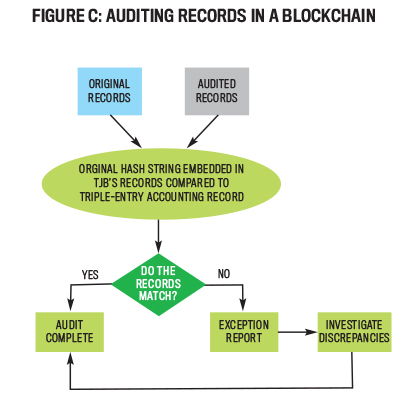 Finally, the blockchain enables a streamlined approach to auditing records because hash strings are matched to the original records, regardless of which company in the network generated them (see Figure C). 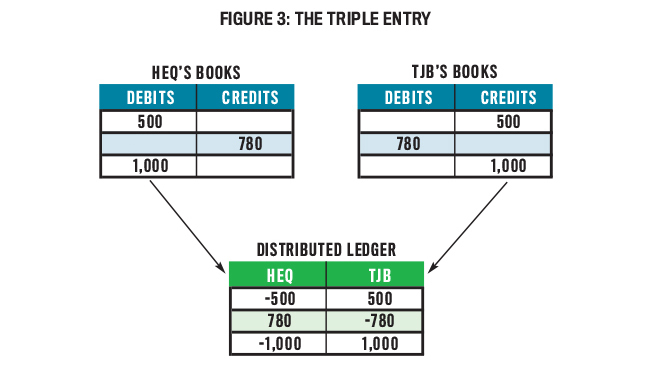 An auditor employed by one member of the network can do a 100% validation of HEQ’s and TJB’s transactions by comparing the original records to the triple entries generated. While both HEQ and TJB will likely retain separate audit firms, the efficiencies gained by using a blockchain ecosystem allow auditors to spend more time on business analytics instead of duplicating low-level verification tasks and reconciliations. This simple example highlights how a seamless, comprehensive, and secure method of transferring value can improve business processes. Although widespread adoption of blockchains is still years away, the triple-entry enhancement is the next step in the evolution of accounting and has potential to improve the public’s trust in corporate governance. president of Wiatt Consulting Services, LLC and a member of IMA’s Austin Area Chapter. 30 января в 19:00 в рамках презентации программы CMA в HOCK Training пройдёт встреча с региональным директором IMA Аланом Малдером. Запишитесь на мероприятие и узнайте всё о сертификации и программе подготовки к экзамену CMA!